Mouse Camp is the first collection for Windham Fabrics by designer Erica Hite and was greatly inspired by the artist�s fond memories of the books from her childhood---of animals in clothes doing human-like things and living inside houses made out of surprising materials. 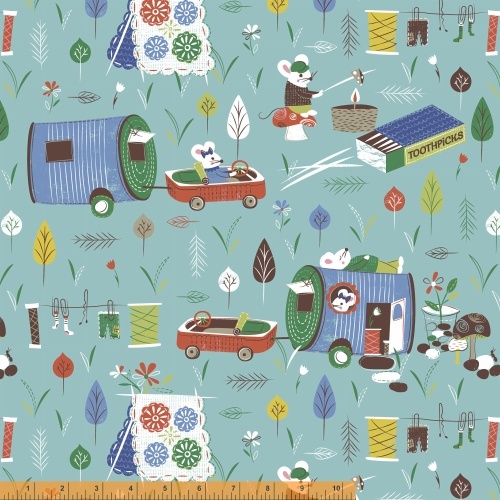 While daydreaming, the Erica wondered what it would be like if a little family of mice enjoyed the pastime of camping, and the result became a story in fabric. This fun children�s collection will be available in corduroy as well as quilting cotton! 15 Total Cotton SKUs. 4 Total SKUs Corduroy - Delivery to stores: April 2015.